Mixed Vegetables Indian Style recipe by The Skinny Cook at PakiRecipes.com. 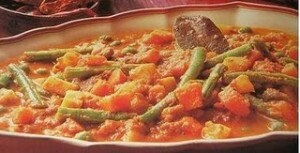 Put in the okras, French beans and carrot to cook for 5 minutes. Add cabbage , green peas , santan and salt to taste.